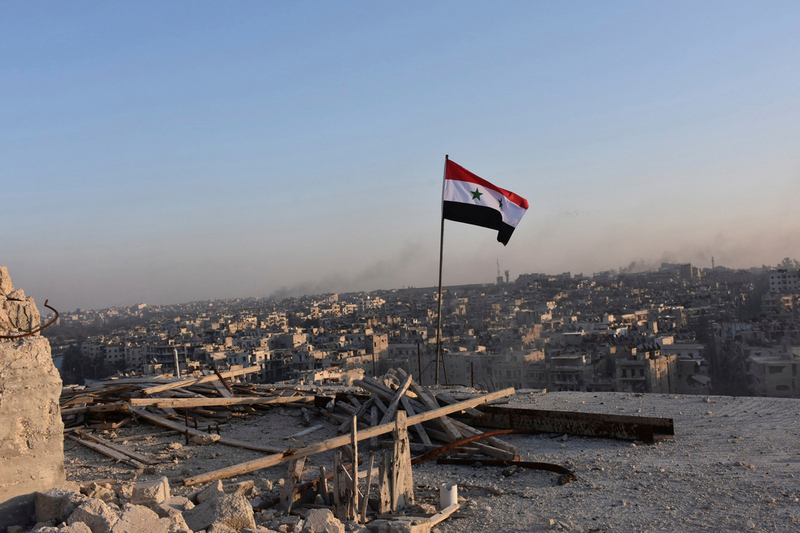 A Syrian national flag flutters near a general view of eastern Aleppo after Syrian government soldiers took control of al-Sakhour neigbourhood in Aleppo, Syria in this handout picture provided by SANA on Nov. 28, 2016. Those militants who refuse to leave Eastern Aleppo will be regarded as terrorists, Russian Foreign Minister Sergey Lavrov said, adding that U.S. Secretary of State John Kerry’s proposal handed over to him in Rome concerned "coordination of specific routes and dates for the pullout of all militants without any exceptions from eastern Aleppo." "Those groups which refuse to leave eastern Aleppo will be treated as terrorists," Lavrov said. "By refusing to walk out from eastern Aleppo they will in fact go ahead with armed struggle. We will treat them accordingly, as terrorists and extremists, and support the Syrian army in its operation against such armed gangs." "We proceed from the assumption the Americans, when they put forward their initiative for letting all militants leave eastern Aleppo, were well aware what steps they and their allies will have to take to influence the militants entrenched in that part of the city," he added.